This is Saturn's north pole bathed in sunlight as the northern hemisphere approaches summer solstice -- enjoy these observations while you can. NASA's Cassini spacecraft is in the final 18 months of its historic Saturn mission to the ringed gas giant, so we'll soon be losing our "live" view of the enigmatic planet - even though Cassini data will keep scientists busy for the years and decades to come. By having a long-duration mission in orbit around Saturn, we've been incredibly lucky to see long-term seasonal changes. As this Feb. 19 image shows, Saturn's northern hemisphere is currently approaching summer solstice and its north pole is bathed in sunlight. As highlighted by the NASA image release, this particular observation is different in that the image appears askew, with north tilted 20 degrees to the right. 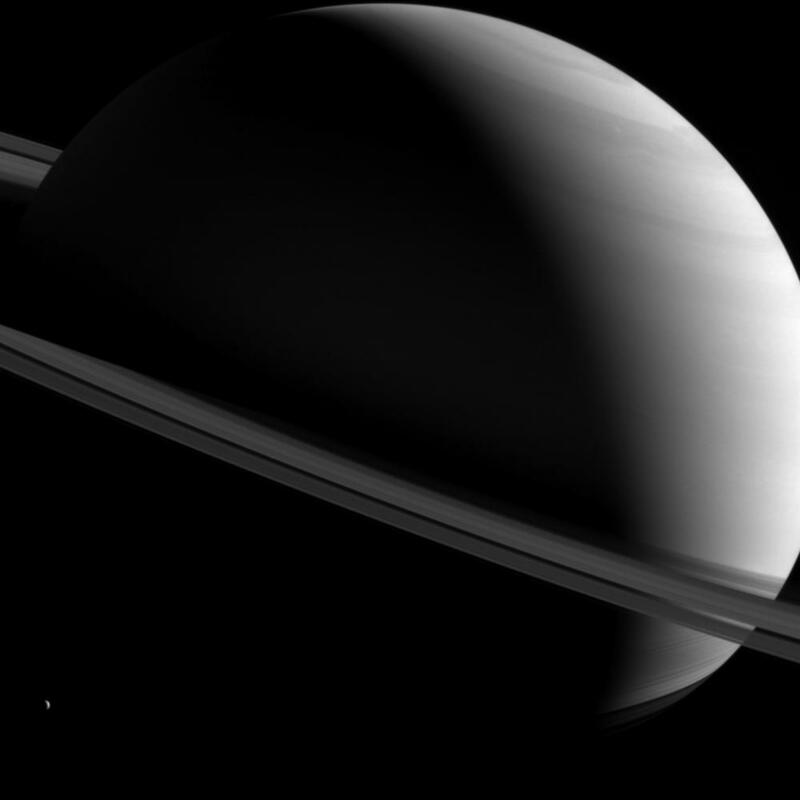 Usually, images of Saturn show the world oriented with its north pole pointing "up" and its rings as a horizontal band. But in this case, as the terminator (the line separating daytime and nighttime) is so slanted because of the season, mission scientists decided to release this "tilted" view. In the full-resolution version, one of Saturn's moons Dione can be seen in the lower left-hand portion of the observation. Cassini was 1.2 million miles (1.9 million kilometers) from Saturn, 7 degrees above the planet's ring plane. In the remaining months of Cassini's mission, the spacecraft will soon be commanded to make a series of maneuvers that will fling the spacecraft through the planet's ring plane, beginning the mission's "Grand Finale" that is planned to end with a fiery encounter with the gas giant's upper atmosphere in September 2017. So enjoy these kinds of observations while you can; there's currently no solid plans to return to Saturn orbit in the foreseeable future. has made its last-ever targeted flyby of Enceladus, the big little moon that has intrigued scientists with its southern ice geysers since Cassini first spotted them in 2005. Browse through a small selection of our favorite raw images from the encounter. Image: A full-globe image of Enceladus captured by Cassini on Dec. 19, 2015.
, coming within 3,106 miles (5,000 km) of the moon’s fractured, frozen, and furrowed surface as it sped past at over 21,000 mph. It captured scientific data as well as some incredible images along the way, including ones showing a crescent-lit Enceladus silhouetted against the layered hazes of Saturn's sky and others revealing the moon's crumpled terrain. Image: The limb of Enceladus imaged by Cassini from a distance of 15,000 miles (24,000 km) on Dec. 19, 2015.
instrument collected data on heat distribution across the moon's shadowed southern pole -- the region where jets of water ice erupt from long cracks in its surface called "sulci." Image: Near-ultraviolet image of a surface furrow on Enceladus called Samarkand Sulci. It's now known -- thanks to Cassini -- that the 320-mile (515-km) wide Enceladus possesses a global subsurface ocean that supplies its jets with organic-laden water and heat sources to maintain its liquid state. What, if anything, might exist in that ocean is a mystery for some future mission; Cassini has made its final visit. Image: Enceladus’ icy jets, seen here in backlit lighting on Dec. 19, 2015, reveal telling evidence for the small moon's subsurface ocean. "We bid a poignant goodbye to our close views of this amazing icy world," said Linda Spilker, the mission's project scientist at NASA's Jet Propulsion Laboratory in Pasadena, California. "Cassini has made so many breathtaking discoveries about Enceladus, yet so much more remains to be done to answer that pivotal question, 'Does this tiny ocean world harbor life?'" Image: Enceladus’ northern terrain imaged by Cassini from 21,000 miles (34,000 km) on Dec. 19, 2015. Cassini will continue to explore Saturn until September 2017, when it will make a final grand dive between the planet's rings and into its atmosphere, returning data as long as possible before literally going down in a blaze of glory. Image: Another raw image of Enceladus’ surface from Cassini on Dec. 19, 2015. Learn more on JPL's Cassini mission site here.